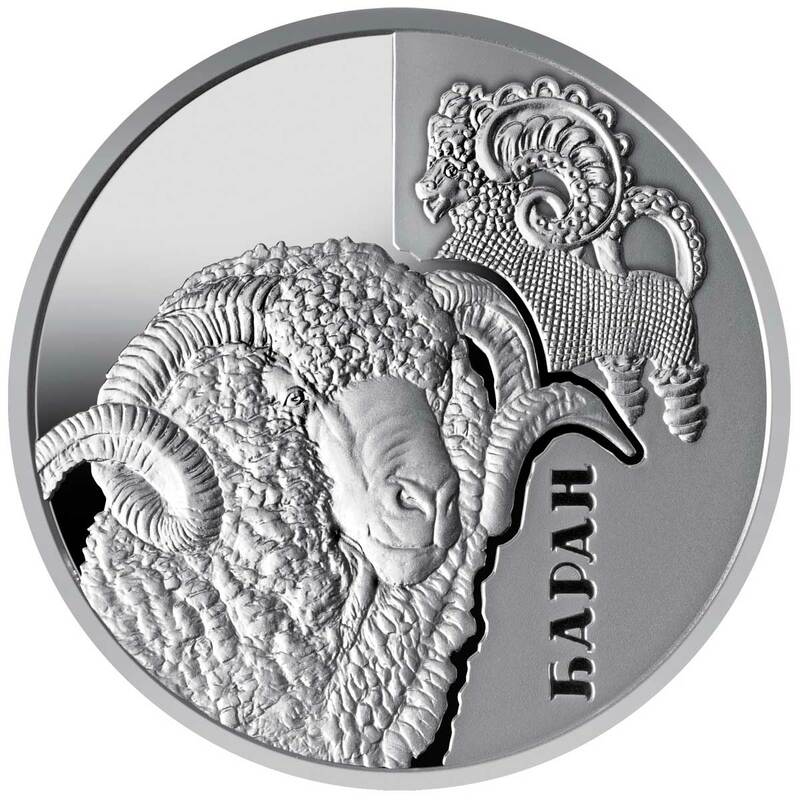 Ukraine has a great recent history of precious metal numismatics, having some fine designs in its repertoire. 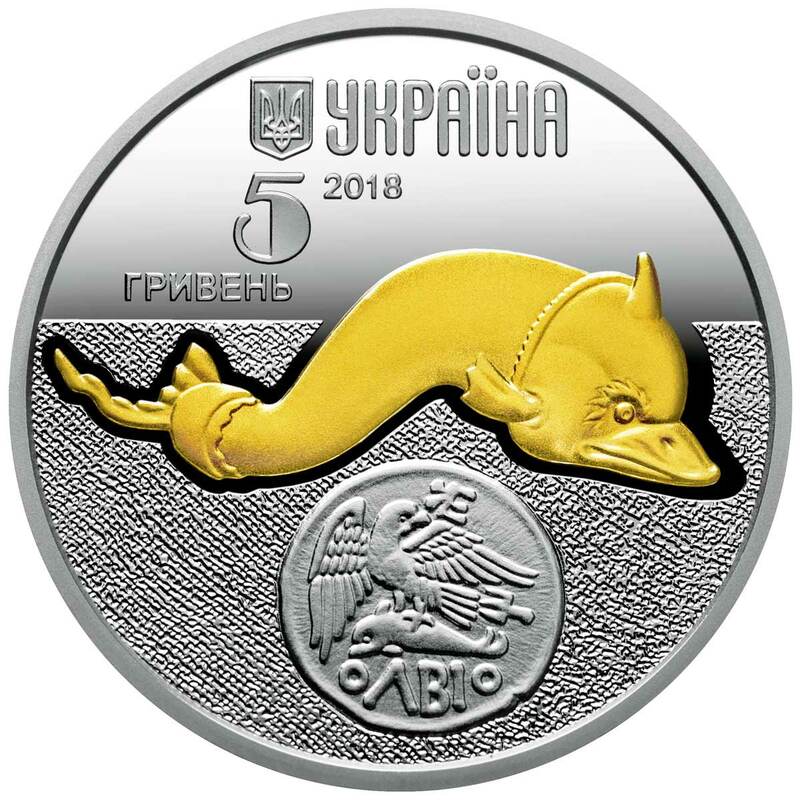 Along with the increasingly popular Archangel Michael bullion coin, the National Bank of Ukraine also issues several series of coins and it’s one of the best ones we’re looking at here. 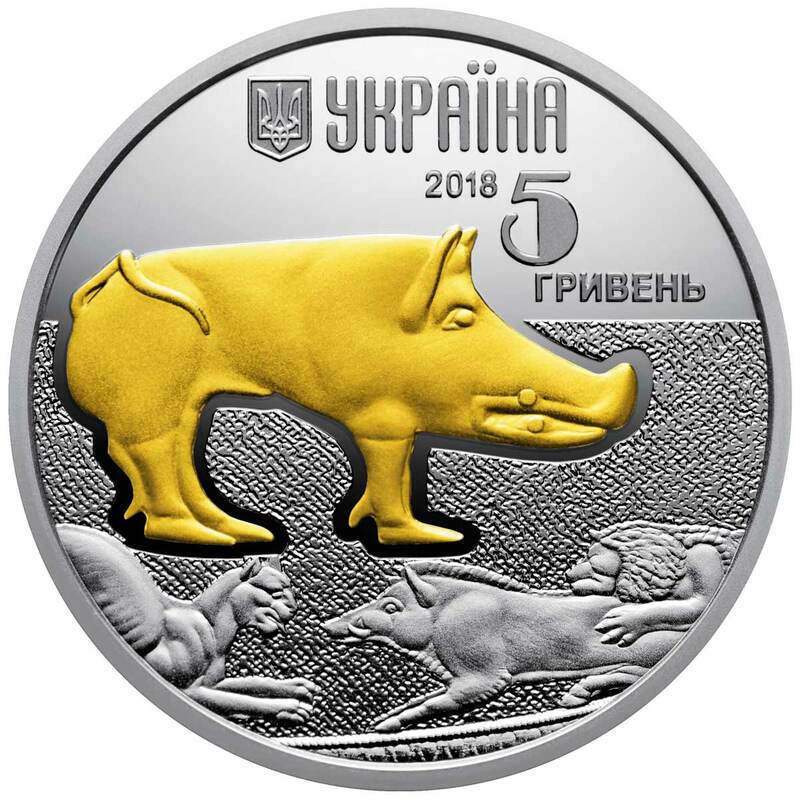 Fauna in Cultural Monuments of Ukraine, apart from an epic name, is an intriguing series that first debuted in late 2016 with the simultaneous release of three coins. Showcasing depictions of animals in art throughout Ukrainian history, it’s already looked at different periods from early prehistory right through to the eleventh century AD. 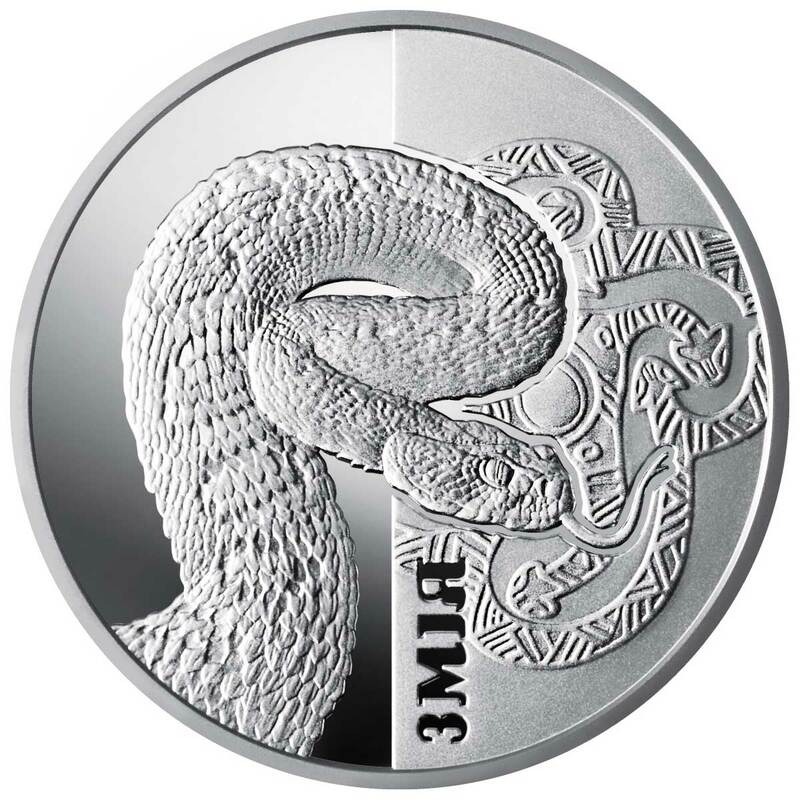 In each case the basic design layout remains the same with each coin showcasing examples of a single animal species in old artwork and monuments. 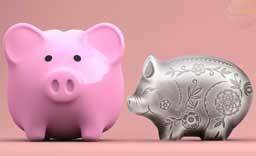 The obverse of each coin has an element picked out with fine gilding. The element is a close-up image of an animal as depicted on a piece of Ukrainian art. In the background is a look at the artifact the depiction originally came from and this remains cleanly-struck with no modifications. Inscriptions include the date, denomination, and the state name and emblem. The reverse is completely clean-struck and free of any modifications. The only inscription is the name of the animal species in Ukrainian. This side again has a background image of an artifact, but it’s a unique piece, not another look at the object on the obverse face. The foreground features a beautifully realised image of the actual animal being showcased. All of the coins released to date are quite superb in our view. 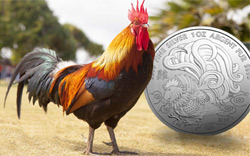 The subject matter is hugely interesting and has been cleverly represented on the coins. 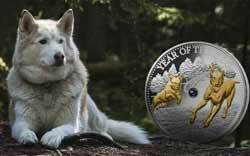 There have been a second wave of three coins released in 2017 and we’re currently just waiting for the Eagle issue in 2018. 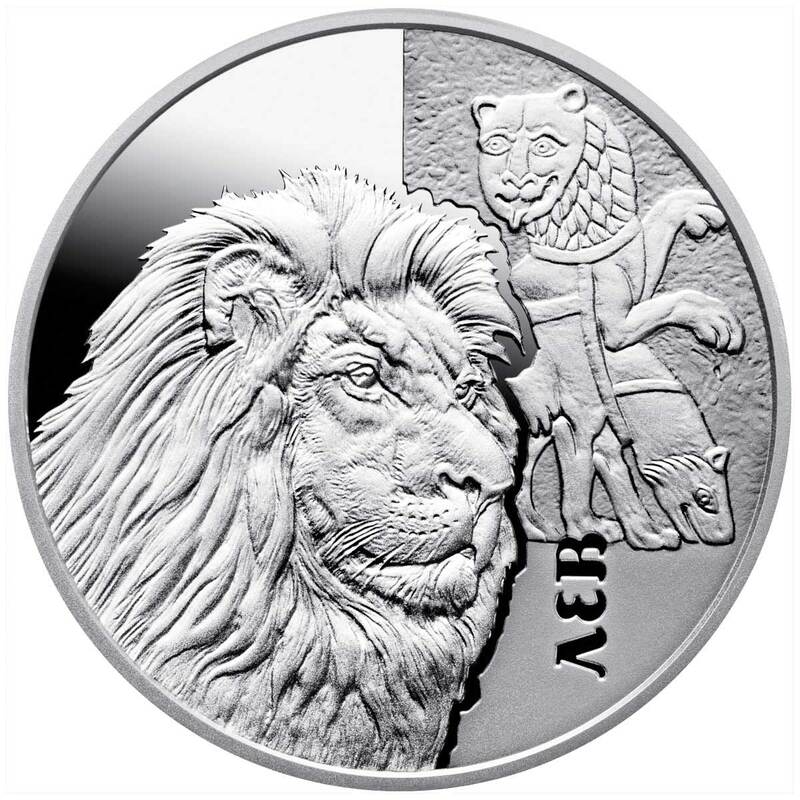 Struck in half-ounce of sterling 0.925 silver, each coin comes with a certificate of authenticity and has an optional box. The retail price of just 574 Hryvnia ($22 USD, £17, €21) without box seems a real bargain for such quality and a set would be quite affordable for most collectors. 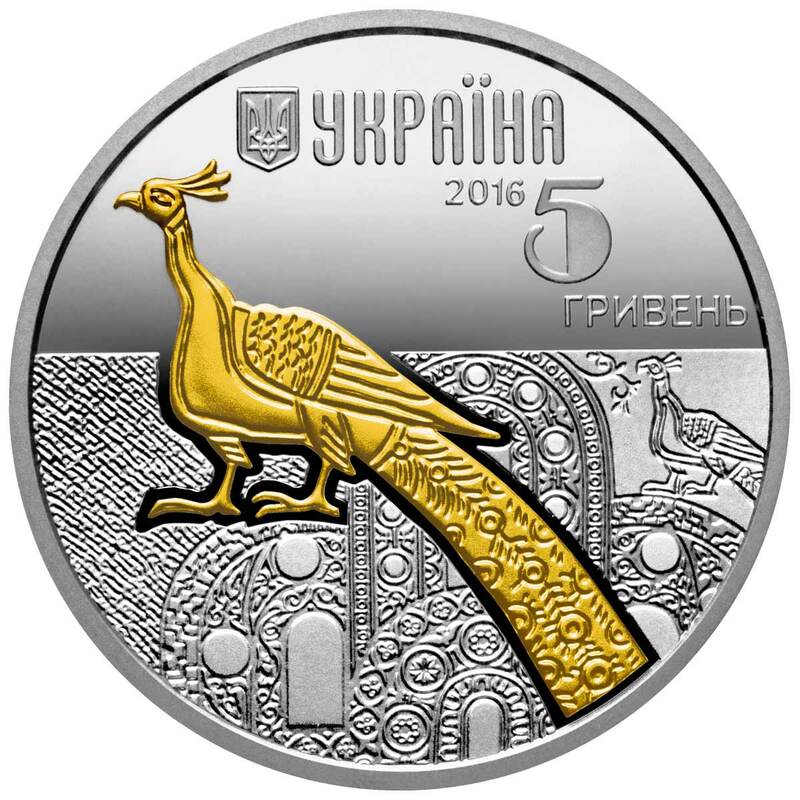 The mintage is set at 4,000 pieces and we’d imagine most don’t leave Ukrainian borders. 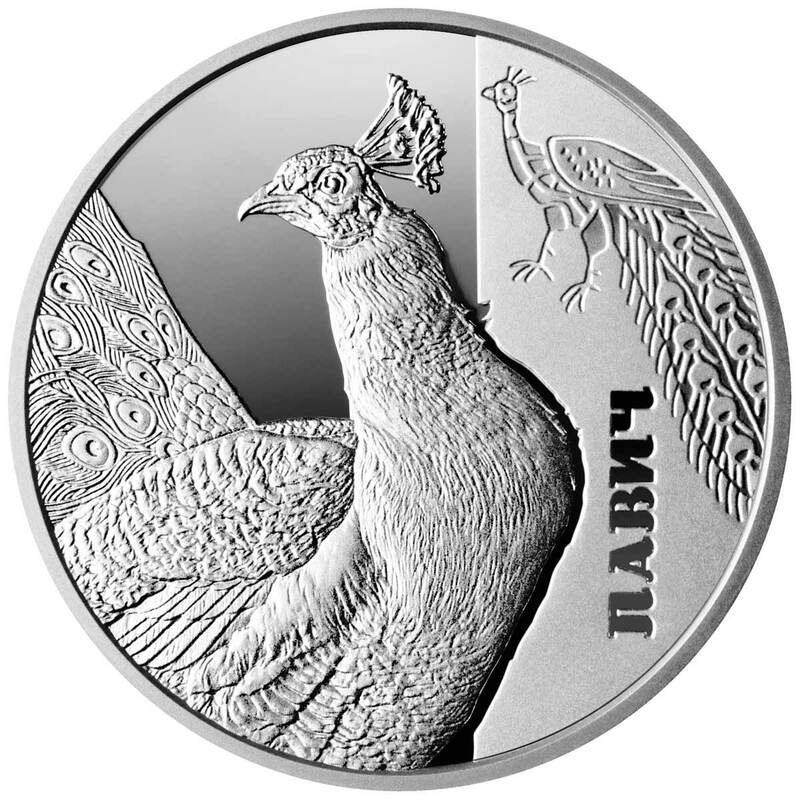 The coin celebrates the peacock and its representations in Old Rus books, which were illustrated and decorated with patterns comprising figures of people, animals, birds, etc. 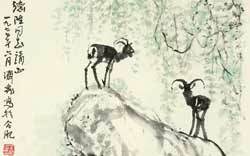 The calligraphers and miniaturists who produced the illustrations in Old Rus books had an impressive artistic taste. 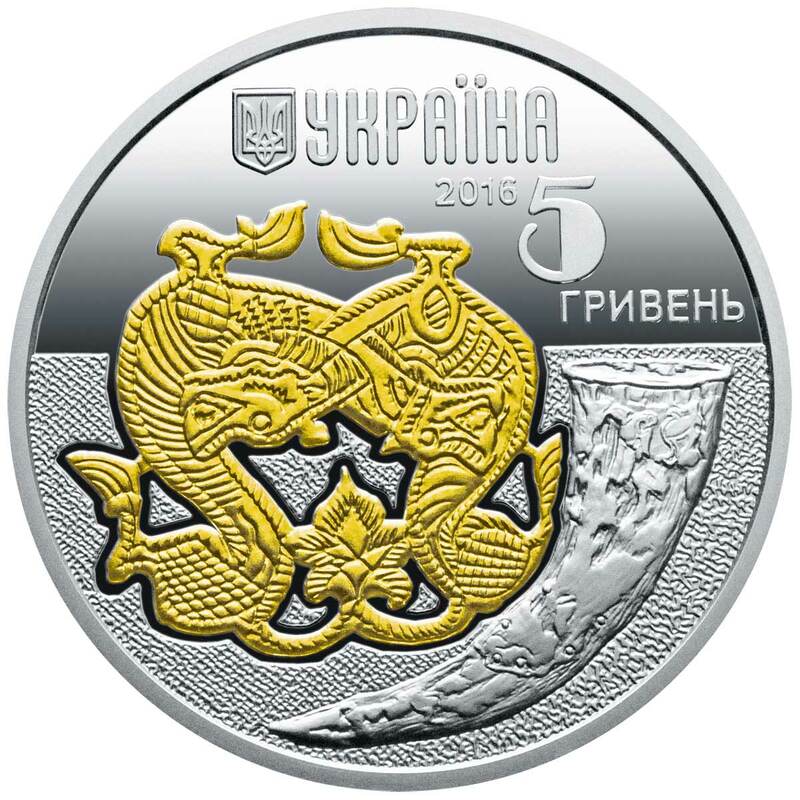 OBVERSE: above are Ukraine`s small coat of arms, the legend УКРАЇНА (Ukraine), the coin issue year 2016 and the coin face value 5 ГРИВЕНЬ (5 hryvnias); in the center, against the background of a miniature from Sviatoslav`s collection of texts dating back to 1073, is a gilt image of a peacock that comes from the same miniature. REVERSE: there is an image of a peacock from a miniature in St. George`s Gospel (A.D. 12th century), under which is the vertical legend ПАВИЧ (peacock). 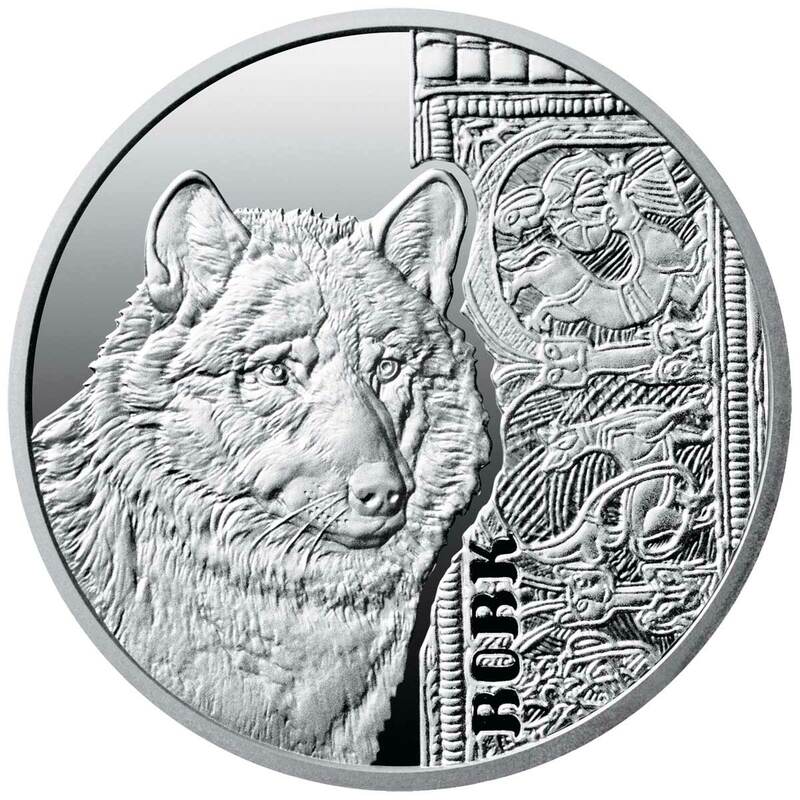 This coin celebrates the wolf and its representations on the cultural monuments of Kyiv Rus, a period in the development of Ukrainian society. The original culture of Kyiv Rus did not copy or adopt the legacies of other cultures. Instead, it organically combined cultural elements from neighboring countries, tribes and peoples with its own traditions. The tribes and peoples that inhabited Ukrainian lands for thousands of years created a culture and handed it down to future generations, ensuring uninterrupted cultural progress. 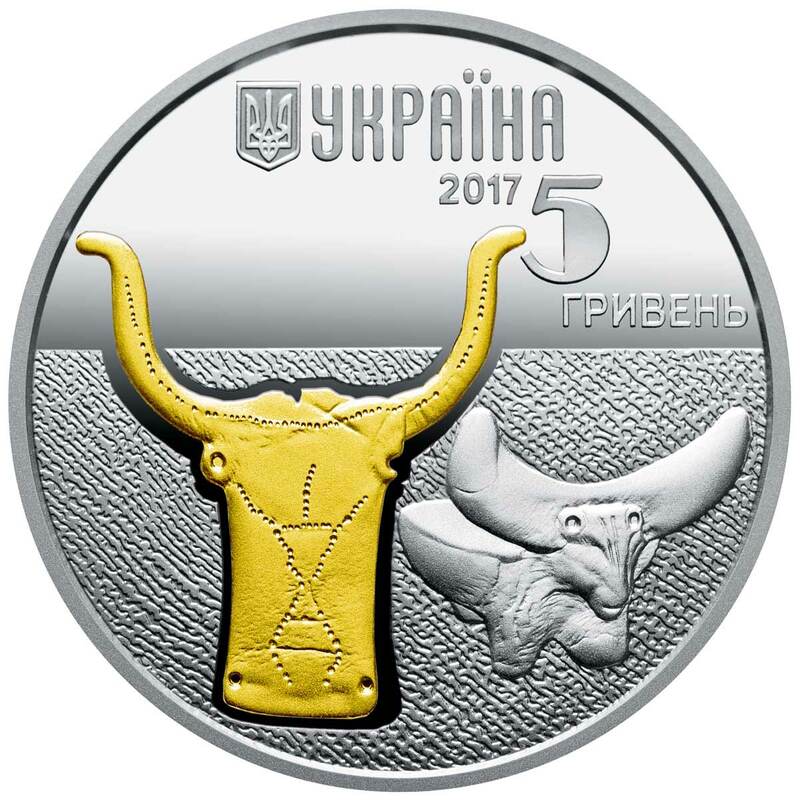 OBVERSE: above is Ukraine`s small coat of arms, the legend УКРАЇНА (Ukraine), the coin issue year 2016 and the coin face value 5/ ГРИВЕНЬ (5/hryvnias); in the center is a gilt fragment embossed on a rhyton (auroch`s horn) that was found in the Black Grave (Chernihiv, A.D. 10th century), depicting two fighting wolves. Near the fragment is an image of the rhyton it comes from. REVERSE: there is an image of a wolf (to the left) against the background of a fragment of a bracelet with wolves found in an ancient settlement in the Principality of Halych (A.D. 12th-13th centuries), and the vertical legend ВОВК (wolf). 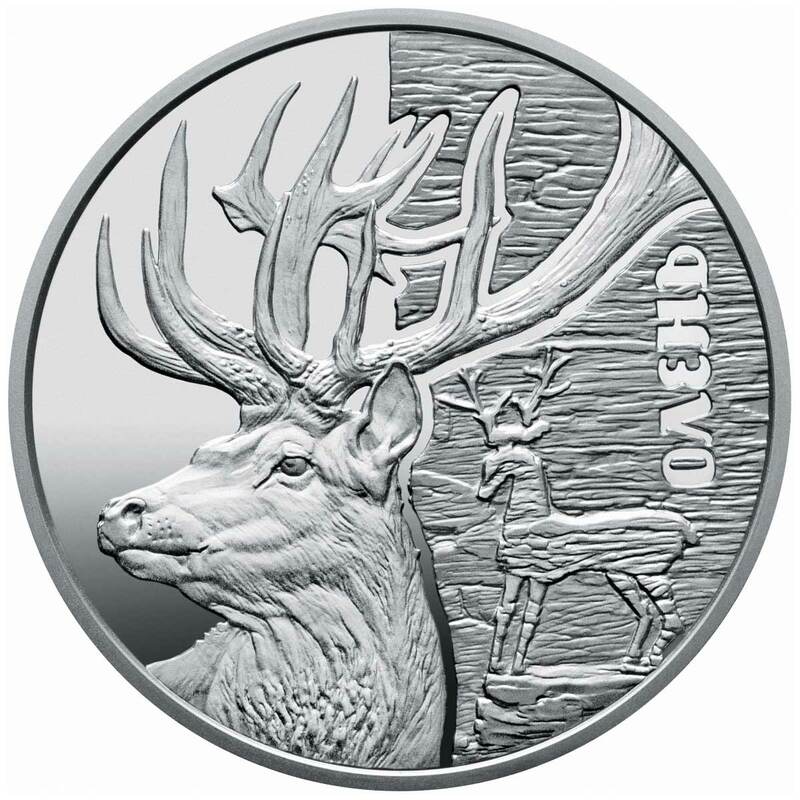 This coin celebrates the deer and its representations, which symbolized its power, speed, and untamed spirit. These representations are found in cultural monuments from various epochs. One of the periods includes the period when the Scythians, who left behind a great legacy, flourished on the Ukrainian steppe. Representations of the deer have also been found in works that are masterpieces of human genius, but whose age and origin have remained unclear for centuries. 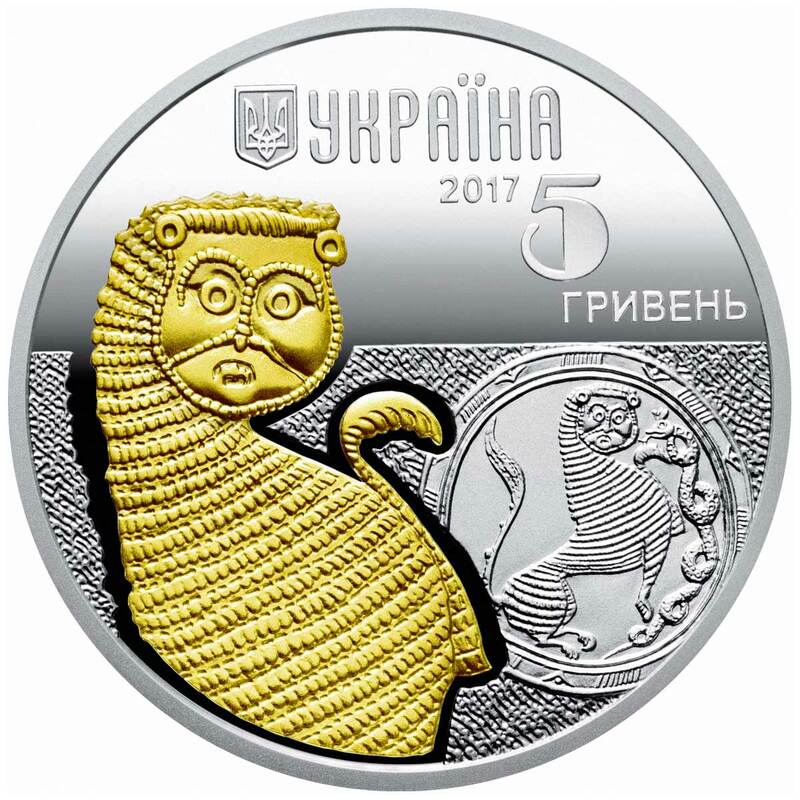 OBVERSE: above is Ukraine`s small coat of arms, the legend УКРАЇНА (Ukraine), the coin issue year 2016 and the coin face value 5/ ГРИВЕНЬ (5/hryvnias); in the center is a gilt fragment of a Scythian pommel shaped as a conventionalized deer that comes from the Thick Grave (Tovsta Mohyla) (4th century B.C.). Near the fragment is an image of the pommel it comes from. REVERSE: there is an image of a deer (to the left) against the background of a relief that comes from the village of Busha and features a deer, and the vertical legend ОЛЕНЬ (deer). The relief was discovered by Volodymyr Antonovych, a prominent Ukrainian historian, in the village of Busha, Yampil region, Vinnytsia oblast, in the latter half of the 19th century. 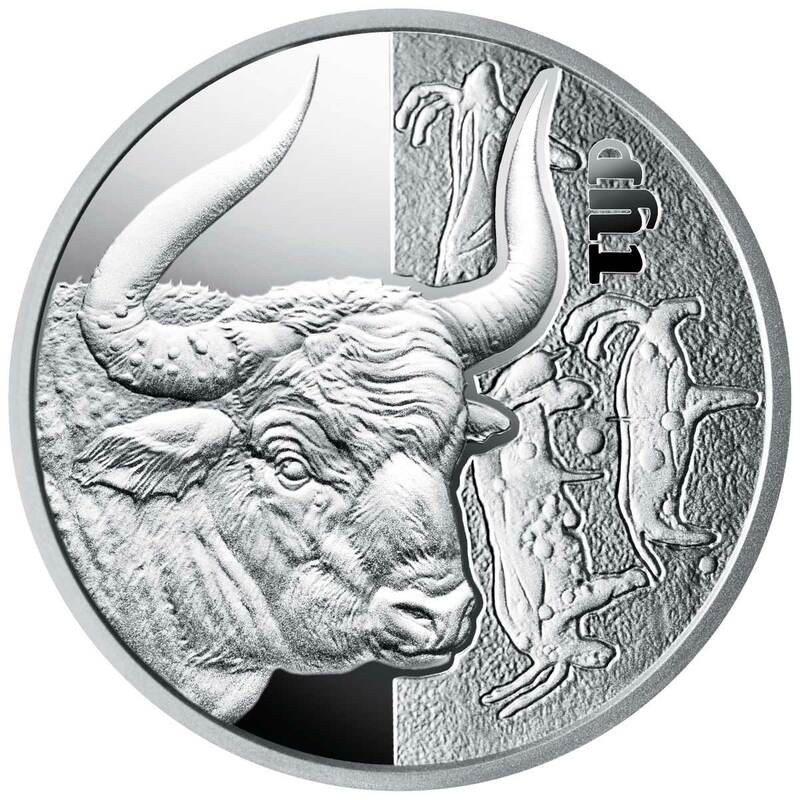 This coin celebrates the auroch and its representations on the unique monuments of ancient cultures that inhabited Ukrainian lands and made an important contribution to the world`s collection of antiques. REVERSE: On the coin depicts the head round (left) and a fragment of rock paintings depicting tour and goats from Stone Graves (Zaporizhia region) (right), in grottoes and caves which contained several thousand petroglyphs – rock carvings dating from the wide historical range from the late Paleolithic to the Middle Ages. Right on the background of the picture is vertical inscription TOUR. 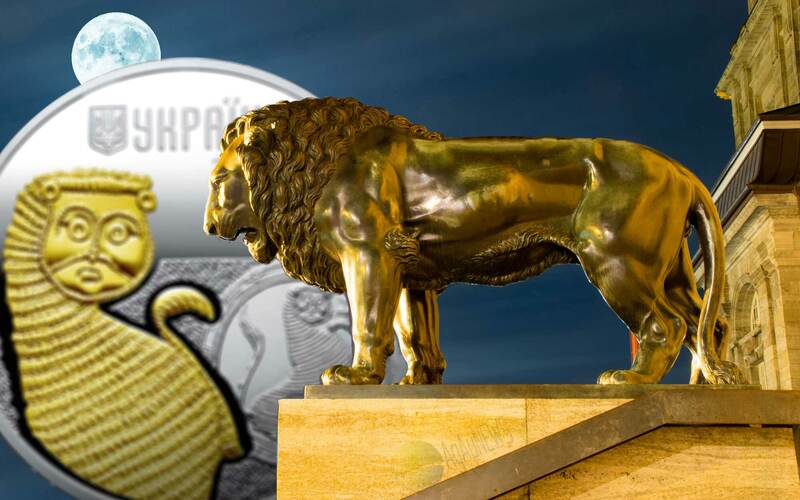 MINTS DESCRIPTION: Dedicated lion and its implementation on the monuments of culture of Kievan Rus. On the territory of Ukraine for millennia lived numerous tribes and peoples who left behind a unique work of art. Priceless culture monuments of ancient times tell how people learn to work with natural materials, giving them strength with symbols – images of birds, animals, people, ornaments and more. 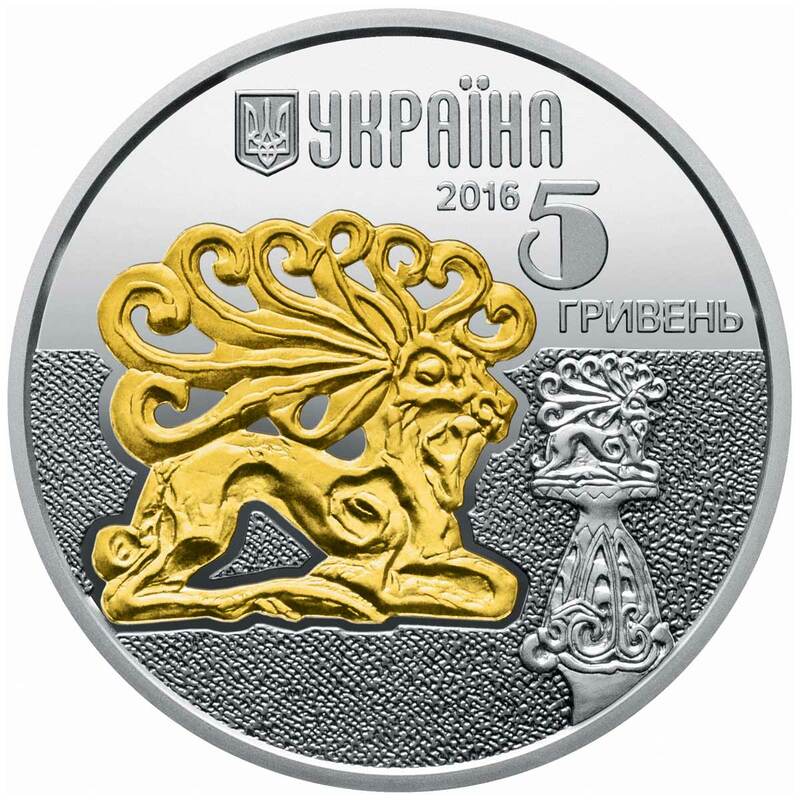 REVERSE: On the coin depicts the head of a lion (left) and a unique piece of slate relief of the Kiev-Pechersk Lavra depicting lions (XI.) 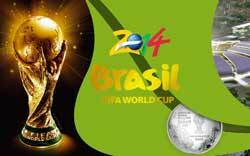 – antique motifs commonly found in decorative art Middle Ages, griffins, centaurs, lions, dragons and more. Right on the background of the picture is vertical inscription lion. MINTS DESCRIPTION: Dedicated to the incarnation of a snake on the monuments of culture of different eras. In the territory of modern Ukraine for thousands of years lived numerous tribes and peoples, who left behind their unique works of art. Invaluable memories of the culture of ancient times tell how people learned to work with natural materials, gave them power through symbols – images of birds, animals, people, ornaments, etc. In the ornamentation of Trypillian ceramics, the image of the snake occupies an important place. In Trypillian culture, the signs of a serpent symbolized a good snake, a guardian of the good nature of the good. 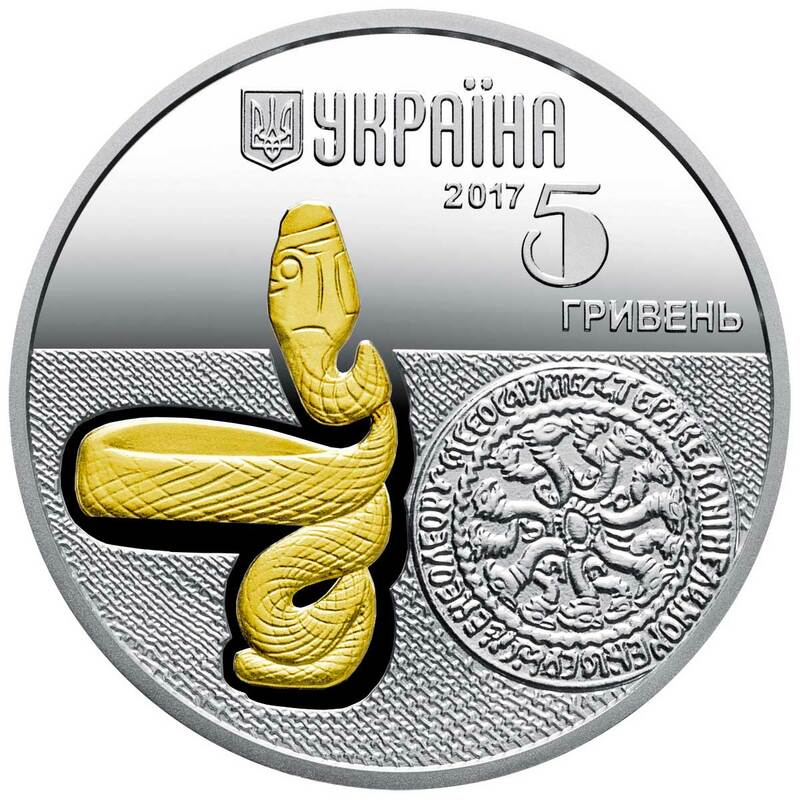 OBVERSE: the small State Emblem of Ukraine, the inscription UKRAINE, the year of issue of the coin 2017 and the face value 5 / ГРИВЕНЬ; in the center there is gold plated (element of decoration: local gilding, gold content in purity not less than 0.0003 g) ring in the form of a serpent (II – III centuries), from the ancient city of Thira (now Bilhorod-Dnistrovsky) , on the right is a coin (XII century) – a necked two-way medallion (very popular in Russia, a kind of wreath with images of a Christian plot on one side and the head of Medusa Gorgon with snakes – on the other). REVERSE: there is a snake depicted on the background of decor of the Trypillya ceramics in the form of a snake. A vertical inscription MEDIA is placed on the background of the picture. MINTS DESCRIPTION: Dedicated to Vepr, the image of which is embodied in the unique monuments of ancient cultures that existed on the territory of Ukraine. 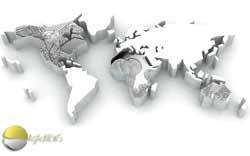 These cultures have made a significant contribution to the world art treasury. Invaluable memories of the culture of ancient times tell about how people learned to work with natural materials and tried to empower them with the help of symbols – images of animals, birds, people, etc. 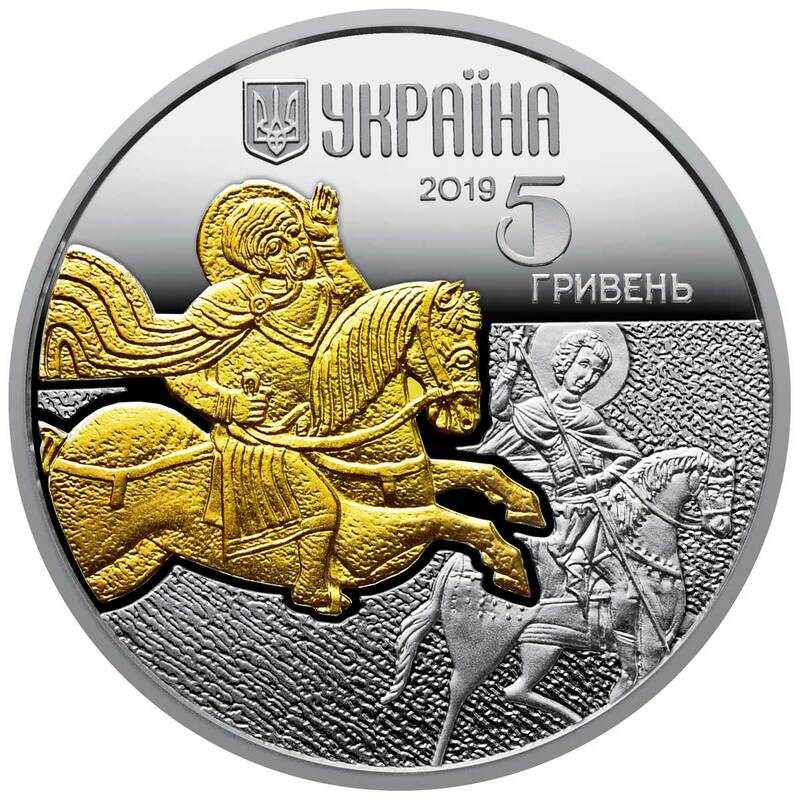 OBVERSE: there is the upper coat of the Small State Emblem of Ukraine, the inscription UKRAINE, under which the coin issue year 2018 and the face value 5 / ГРИВЕНЬ; in the center there is a gilded image (element of decoration: local gilding, gold content in purity not less than 0.0005 g). Vepa – Scythian sculptural gold figure of the end of the IVth century. until e., under which the scene of torture from Pectoral (on the middle of IV century BC, the Tomb of Tombs) on a matte background. 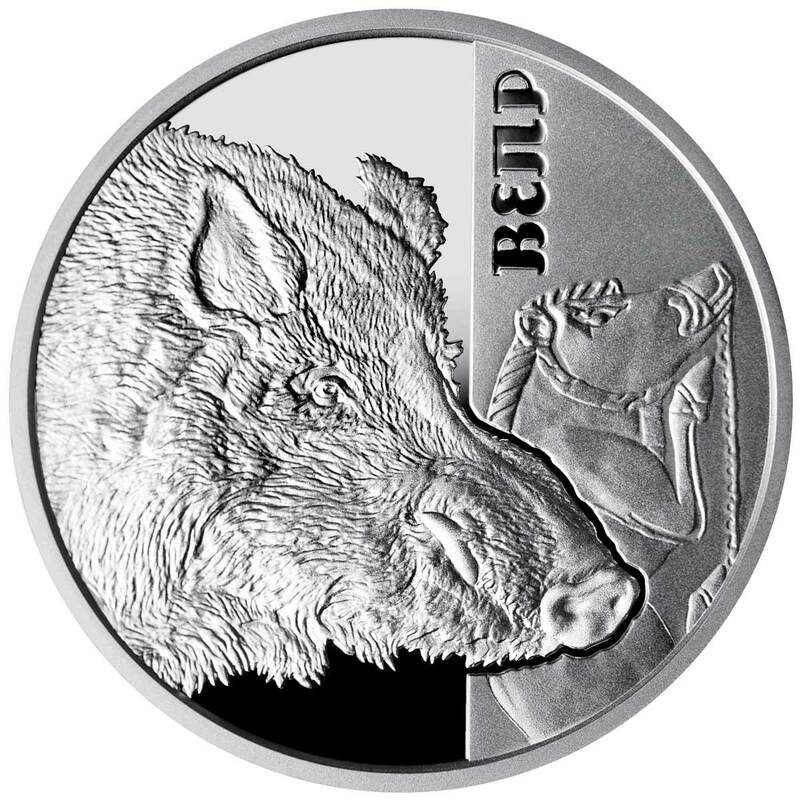 REVERSE: On the reverse of the coin on the left, on the mirror background there is a boar depicted on the right of which on a matte background is a vertical inscription VIPR (above) and a stylized fragment of the Scythian plate with the image of a boar (to the right). MINTS DESCRIPTION: Dedicated to dolphin, the image of which is embodied in monuments of culture of different eras that existed on the territory of Ukraine. 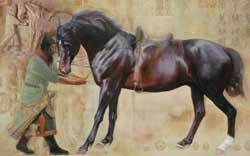 These cultures have made a significant contribution to the world art treasury. In the territory of modern Ukraine for thousands of years lived tribes and peoples who created a distinctive culture, handing it inheritance to the next generations. Beliefs and religions have shown a respectful attitude of people towards nature, in particular to animals. 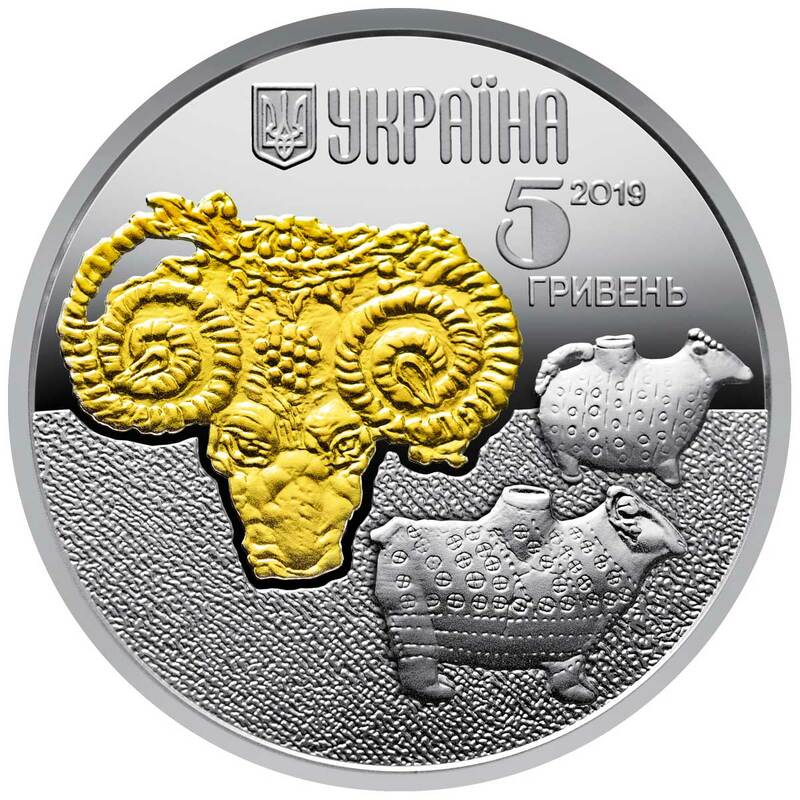 OBVERSE: there is the upper coat of the Small State Emblem of Ukraine, the inscription UKRAINE, under which the coin issue year 2018 and the face value 5 / ГРИВЕНЬ; in the center there is a gilded image (the element of decoration: local gilding, the content of gold in purity is not less than 0.0004 g); dolphin – a dolphin-like fibula from the Nogaychinsky burial mound (Sarmatian era); below it – the Olbia coin (IV cent. is.). 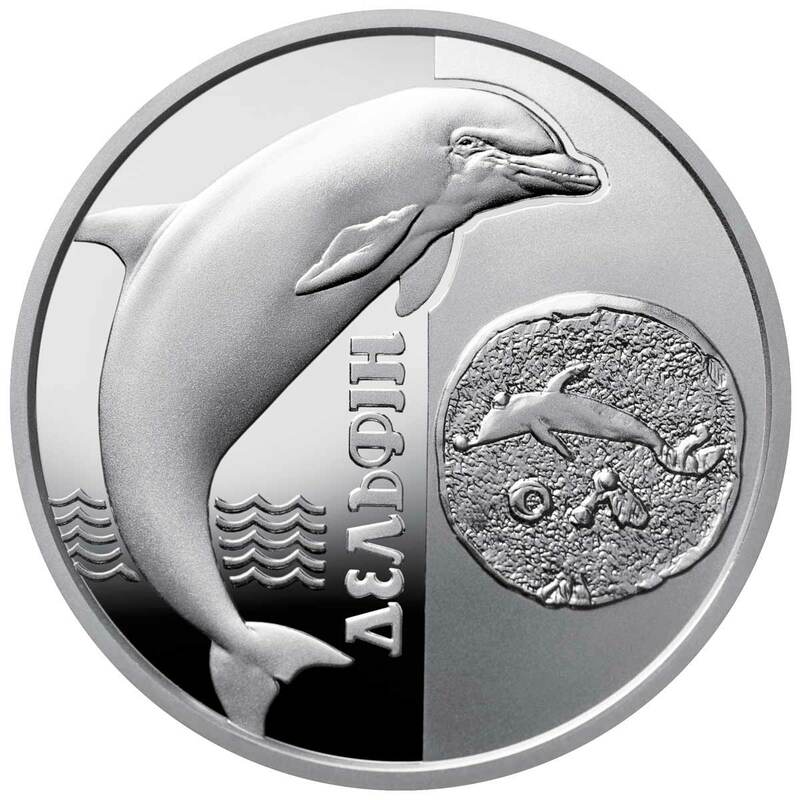 REVERSE: on the left, on the mirror background depicted a dolphin, stylized waves (beneath), to the right of which there is a vertical inscription Dolphin, on the right of the matte surface there is a Olbia coin depicting a dolphin. MINTS DESCRIPTION: Dedicated to the ram, the image of which is embodied in the cultural monuments of different eras, created thanks to the talent and work of many thousands of nameless masters. During the centuries of modern Ukraine, the tribes and peoples who created the culture, inheriting it for subsequent generations and providing continuous progressive development, lived. Beliefs and religions demonstrated a respectful attitude of people towards nature, in particular to animals. 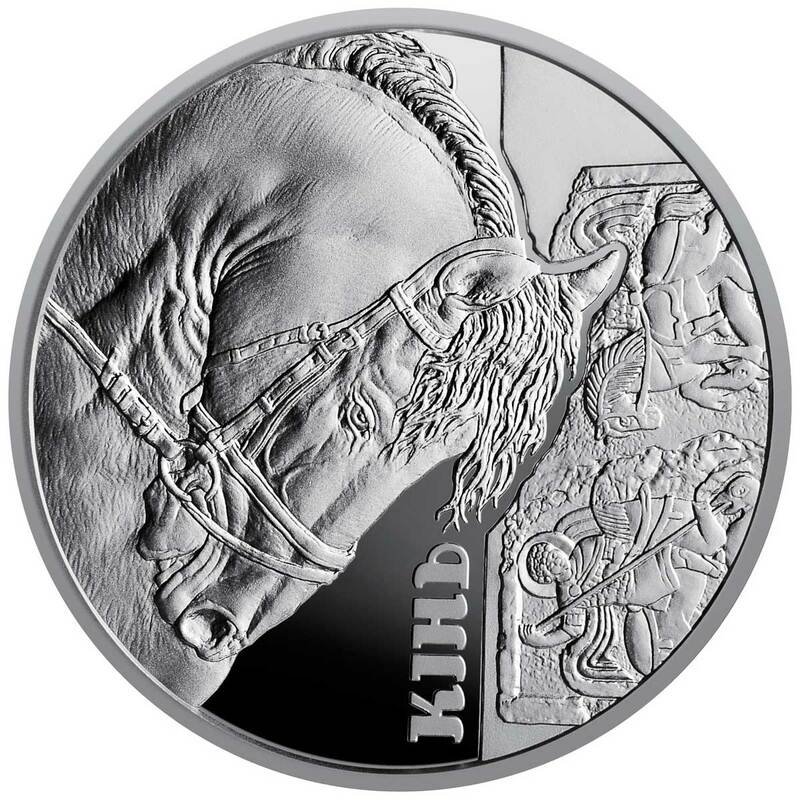 MINTS DESCRIPTION: The horse is dedicated to the image of the cultural monuments of Kievan Rus – one of the brilliant pages of the history of our nation’s culture, which is an integral part of the world cultural heritage. In the territory of modern Ukraine, for thousands of years, tribes and peoples who created a distinctive culture, inheriting the next generation, lived. Beliefs and religions demonstrated a respectful attitude of people towards nature, in particular to animals.